Cleaner Kit 1.3 free download. 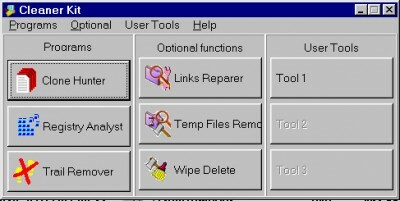 Various programs of the Cleaner Kit are able to monitor your systen registry and clean it of obsolete and invalid entries, free your disk space by removing unnecessary duplicate files, protect your privacy by removing trails that are left in your browser cache and history after you accessed various web-sites in the Internet. Cleaner Kit also includes several additional functions, that will remove unnecessary temporary files on your disk, check and repair a link integrity in your system and will give you the ability to delete files that you do not want to see restored. Programs Included: Registry Analyst, Clone Hunter, Internet Trail Remover + 3 additional functions to provide you a maximum control over your system. System Cleaner 4 in 1 is a very useful suite of tools to clean your system, it includes Disk Cleaner, Registry Cleaner, History Cleaner and Startup Cleaner. System Cleaner allows you to clean your drives from unnecessary and temporary files. Awin System Clean is a set of system-maintenance and optimization utilities for enhancing Windows performance. This utility secures your privacy by searching and removing trails that were left by your Internet browser and various web-sites on your disk after you browsed the Internet. Internet Cleaner is a privacy protection and hard drive clean-up tool that will help you remove all traces of your online and offline activity and free up some space on your hard drive by removing the unnecessary files. Advance System Optimizer is the easiest and most comprehensive way to keep your PC running smooth and error free. Trace Eraser is the easiest and most comprehensive way that allows you to keep your PC running smooth and error free.